You should check our online calendar to see if there are any last-minute changes; however, the clinic does have a regular schedule and location. WHEN: From 10 am - 12 pm, on the 2nd Saturday of each month. Volunteers should plan to be there from 9:30 am - 2:00 pm. WHERE: The clinic alternates every month between South Los Angeles (in odd numbered months--January, March, May, July, September & November) and Long Beach (in even-numbered months--February, April, June, August, October & December). To register for assistance at the clinic, call our intake specialist, Charsleen, at 323-357-8431 during regular business hours. In order to be eligible for expungement, you cannot be currently on probation, parole, or facing an open case, and we will need your full criminal history (either court dockets or RAP sheet) to assist you at the clinic. Charsleen can help you determine whether you are eligible, and what you need to bring. You do not need any special legal experience or knowledge to volunteer at our clinic. We encourage everyone with a genuine interest in serving people with conviction histories to volunteer, and are particularly committed to encouraging people with conviction histories themselves to volunteer. Most of our volunteers are law students from UCLA Law and other area law schools, but we have many community volunteers with no legal background. We especially rely on community volunteers during the summer months, when most law students are not in school. If you wish to volunteer, you should attend our volunteer training. Training is held in South LA every other month, from 5:30 pm - 8:00 pm on the Thursday before the clinic. Contact CT Turney at ctturney(at)anewwayoflife(dot)org to register for the training and for the specific date and location. We ask that volunteers arrive at the clinic by 9:30am and expect to stay until 2pm. Lunch is provided. A volunteer reading a print-out of court case docket. The main service that's "advertised" about the Reentry Legal Clinic has to do with setting aside and dismissing an adult conviction in the State of California--commonly (and misleadingly) referred to as "expungement." If the petitioner is eligible to reduce his felony-wobbler to a misdemeanor, we do that too. Sometimes, if the stars line up just right, we also move for an early termination of probation to restore the petitioner's eligibility for "expungement." Except in very, very exceptional cases, however, we don't do petitions to seal and destroy a juvenile record, to seal and destroy an arrest record, or for a certificate of rehabilitation. Why? Because we don't "clean slate" just for the sake of clean slate. When you visit our monthly clinic in South Los Angeles, you won't see anyone writing a single motion. Mostly, you'll see our volunteers poring over the conviction records of the people sitting with them. Yes, once their records are processed, the legal department of A New Way of Life Reentry Project will most likely file expungement (and related) petitions on their behalf. But that's not what we really set out to do. Today, in the State of California, there is no way to truly wipe the slate clean once a person is convicted of a crime. He will change, in due time, as everybody does. But his record will follow him for the rest of his life--be it licensing, employment, or housing. So we don't make him any false promise: "Everything will work out just fine after you expunge your record." No, it won't. Instead, we help him deal with the harsh reality he faces--and, eventually, change it. So our services start with "expungement." But that's just where we start. We also identify what barriers a person faces, and will likely face, because of his conviction history. Then we give him the tools to overcome those barriers--what rights he currently has under the existing laws and regulations. Sometimes we don't see how he can overcome a particular barrier. Then we tell him about ways he can help change that. Every historical account, whether of an individual or of a collective, starts in media res. Ours starts in 2006--at the conclusion of a long-running discussion between two activist friends, Susan Burton and Saul Sarabia--when a UCLA Campus-Community Partnerships grant was awarded to A New Way of Life Reentry Project ("ANWOL") to fund Prisoner Reentry Initiative ("PRI") for 2 years. The agency representing UCLA was the Critical Race Studies ("CRS") program at the UCLA School of Law ("UCLAW"). It was a partnership that made sense. ANWOL was acutely aware of the problems facing the community it served. CRS had the resource to research ways of tackling those problems. Toward the end of the 2-year PRI, ANWOL and CRA launched a pilot "expungement" clinic, called Reentry Legal Clinic, which most people at UCLAW referred as the PRI Clinic. It was located on the main campus of the Watts Labor Community Action Committee ("WLCAC") and was designed to be held twice a semester to accommodate UCLAW's academic calendar. The purpose of the clinic wasn't just to start a free "expungement" clinic, although everyone recognized the need for one in South Central Los Angeles; rather, its main purpose was to serve as the ears and eyes of activists fighting against mass incarceration. So the clinic, from Day 1, screened participants for Title VII claims in addition to providing assistance with their pro-per 1203.4 petitions. When ANWOL hired a staff attorney in 2008, the Reentry Legal Clinic became a regular monthly clinic with the ANWOL staff attorney as the main supervising attorney and added screening for additional claims related to the stigma of a criminal record. We are supported by a team of dedicated volunteers and co-chairs from both from within the law school and outside it. In 2012, we assisted 377 people at 14 clinics. 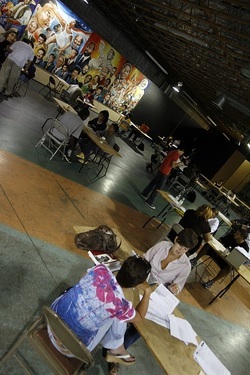 (In addition to our 12 regular clinics, we held two extra clinics to establish ourselves in Long Beach.) A New Way of Life filed 929 individual petitions in 2012, the most in any year so far. This number includes all types of petitions, but does not “double count” petitions that included both a request for expungement and a request for reduction from felony to misdemeanor. Of the petitions for which results are known, we achieved an 83% success rate in having petitions granted. Although our records from the earliest clinics are not 100% complete, since opening its doors the clinic has assisted about 1,100 individual people with conviction histories. During that time, A New Way of Life has filed almost 2,400 petitions, with an 82% success rate among those petitions with known results.